If you have school age kids you will have no doubt spent hours in the mornings yelling “hurry up, where are your shoes, clean your teeth faster, turn off the telly, hurry up (again)” and racing out to the car and swearing at the traffic. But it doesn’t have to be like this. 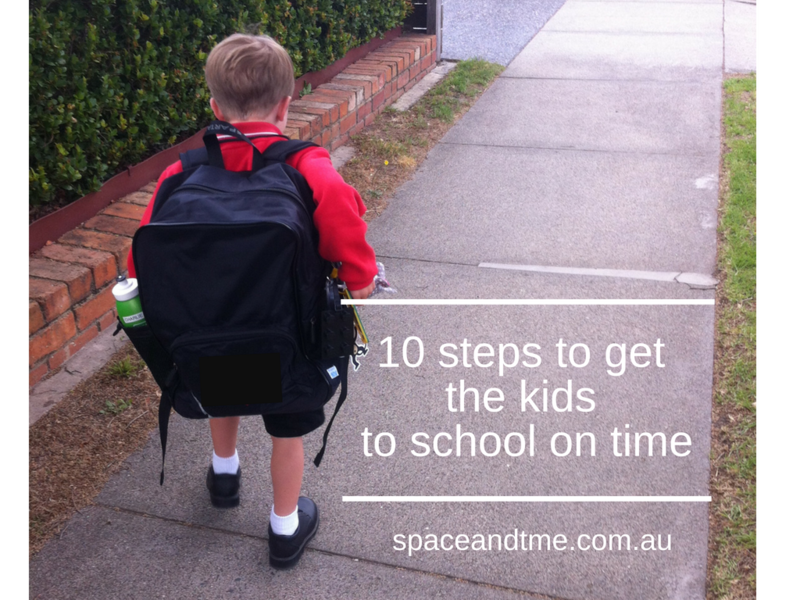 Follow these 10 steps to get to school on time with less stress and less shouting! 1. Know how long it takes everyone to get ready – even if the kids have been at school for years, do a dry-run on the weekend, and time each stage – shower, dressing, breakfast, pack bag. Also time how long it takes you to drive to school, park the car and walk to the classroom. Once you know this information you can plot out your morning. The most important times being the time your alarm goes off and the time you walk out the door. Stick to these times and you will rarely be late again! 2. Unpack school bags – Each afternoon the kids need to unpack their bags as soon as they walk in the door. Put lunch box on sink to be washed out, (or straight into the dishwasher, or better still, get them to wipe it out and put it away for the next day). School work, diary and take home books put in a dedicated spot. 3. Kids to shower – save arguments over wasted water, knotted hair and shampoo in the eyes by getting the kids to have their shower in the evening. 4. Prepare clothes – Get all school clothes out and lay on bed. Ensure shoes are under the bed (there are few things worse than looking for shoes as you are trying to get out the door in the morning). Add underwear, socks and hair accessories. 5. Pack lunches (or at least non perishable) – Add as much to the lunch as you can the night before. In theory, you certainly can pack the whole lunch including sandwiches and put them in the fridge overnight. 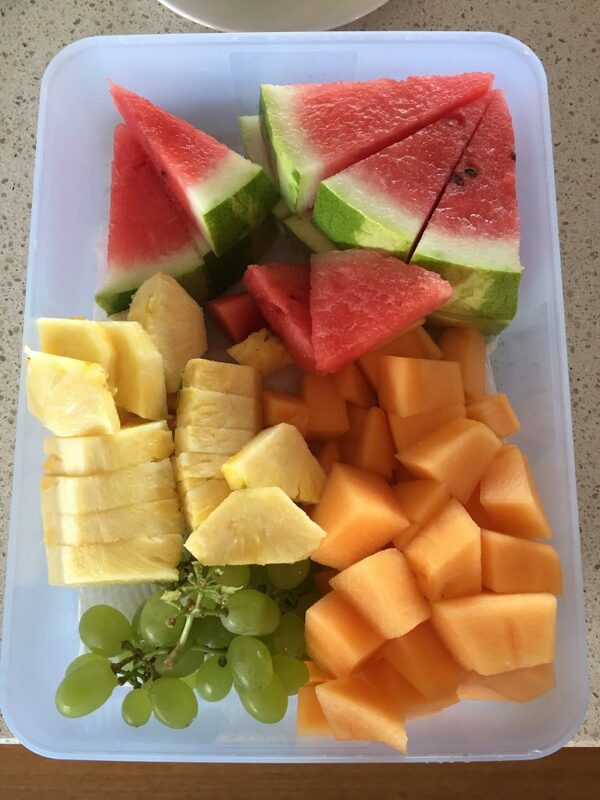 At least spend some time on the weekend cutting up fruit – this will keep at least 3 days, longer for some fruit. 6. Set the table for breakfast – decide what’s for breakfast the night before and get out plates, bowls, spoons etc along with cereal or bread. 7. Set an alarm – Parents have great success giving ownership to the kids here. Give them an alarm clock, let them figure out how to set the alarm and leave them to get up when it goes off in the morning. 8. Checklist – Create a check-list and ensure kids tick off all their “jobs” (breakfast, get dressed, pack bag etc) before they are allowed free-time. Need more help to set up a morning and afternoon routine check out this blog. 9. Time to go – Know the time you need to head out the door to the car – set an alarm in your phone with a 5 minute warning. 10. Parents/caregivers – Follow all of the above for yourself so that you aren’t the one holding things up in the morning! Following at least a few of these 10 steps will drastically change how your school mornings run. Contact me if I’ve left something off the list that gets your kids to school on time. Do you and your family need a hand to put a morning and afternoon checklist together to thwart the shouting? Call Julie Cliff on 0413 447 562 or You can book me here.